Dan Arcy is the global OEM technical manager for Shell Lubricants. As engine technology and component materials have changed, coolant technology has also changed, particularly with the use of more aluminum in engines. However, there is a misconception that all coolants are interchangeable. Actually, there are two distinctly different types of coolant: older conventional fully formulated and the newer extended life coolant with organic acid technology (OAT). They each protect engines from corrosion very differently and when the two are mixed, both are diluted, and their effectiveness can be significantly reduced. The primary difference between fully formulated coolants and extended life coolants (ELC) is the length of time and miles for which each will remain effective. ELCs offer significant maintenance cost savings over the life of the coolant. While fully formulated coolants can provide protection for up to 200,000 to 250,000 miles, extended life coolants are designed to go 600,000 on-highway miles and beyond with proper monitoring. Fully formulated coolants contain silicate and other inorganic additives along with supplemental coolant additives (SCAs) to provide engine and cooling system protection. They offer a stabilized, low-silicate formula that helps reduce deposits and the risks of hard water scale. Fully formulated coolants typically contain nitrite and often molybdate to prevent corrosion damage, which results in pitting on cylinder liners. Fully formulated coolants can provide protection for up to 200,000-250,000 miles or two to three years in heavy-duty applications under normal operating conditions, provided that the user monitors and maintains SCA additive levels. ELCs offer complete cooling system component protection by helping to reduce water-pump failures, hard-water-scale deposits and silicate gel (the green goo you often see). They typically utilize organic additive technology corrosion with nitrite and molybdate that protect cylinder liners from pitting corrosion damage. ELCs help reduce maintenance costs and improve water pump life, as well as eliminate the need for costly supplemental coolant additives. Nitrite-Free ELCs are formulated to meet more severe operational conditions of modern, hotter-running engines. Nitrite-free coolants provide improved protection of aluminum components including modern brazed aluminum heat exchangers and meet many of the newest OEM specifications. The versatile formulation may also be used in fleets that include cars and light-duty trucks. The coolant is proven for extended life operation in medium- and heavy-duty diesel, gasoline, LNG and natural gas vehicles and engines. 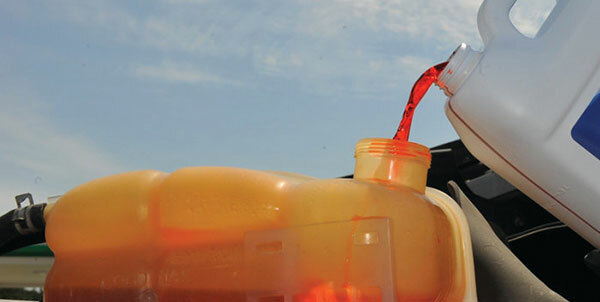 If a coolant has been mixed or is out of specification, you don’t usually have to drain and refill the entire system, which can be dozens of gallons for larger vehicles. Concentrated coolants allow technicians to bring the coolant levels to recommended freeze points. A freeze point correction chart for coolants will show how to adjust your coolant so that it is at the proper level. Shell Lubricants, for instance, has ELC correction fluids which are used to restore additive content to recommended levels. These two procedures enable you to bring your equipment’s coolant back into spec without draining the cooling system. It is a good practice is to check the coolant every time your change the oil or conduct preventive maintenance.